Today, when you order "Snowstorm by Jay Sankey (Trick Only)", you'll instantly be emailed a Penguin Magic gift certificate. You can spend it on anything you like at Penguin, just like cash. Just complete your order as normal, and within seconds you'll get an email with your gift certificate. You make a quick sketch of a �snowflake globe� across the face of a SIGNED card. You give the card a brisk shake and the snowflakes come to life scattering across the face of the globe! You give the card one final shake and the snowflakes VISIBLY arrange themselves into the number and suit of a previously selected card! The signed card may be handed out for examination. This card trick is easy to learn and resets in seconds. Q: How long will it take me to master this effect? Created by Jay and his friend Richard Sanders, this trick is taking the magic world by storm! A card is selected and returned to the pack. The magician then has a second card selected and SIGNED(!). Across the face of this second card, the magician makes a quick sketch of a "snowflake globe". He then gives the signed card a brisk shake and the snowflakes literally come to life, SCATTERING THROUGHOUT THE GLOBE! The magician gives the face-up card a final brisk shake and (as unbelievable as it sounds) the snowflakes visibly ARRANGE THEMSELVES into the number and suit of a previously selected card! The signed card is then handed-out for examination! Talk about a reputation-maker! This easy-to-learn effect resets in seconds and comes complete with specially printed cards. Please note: This package does not include a DVD. 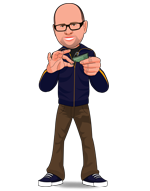 You will receive all necessary props, complete instructions, and access to an exclusive FREE INSTRUCTIONAL VIDEO DOWNLOAD in your MyPenguinMagic section. Everything you need to perform this unique and amazing effect. Jay has taken a basic card change and gussied up a bit with an entertaining premise. Nice! 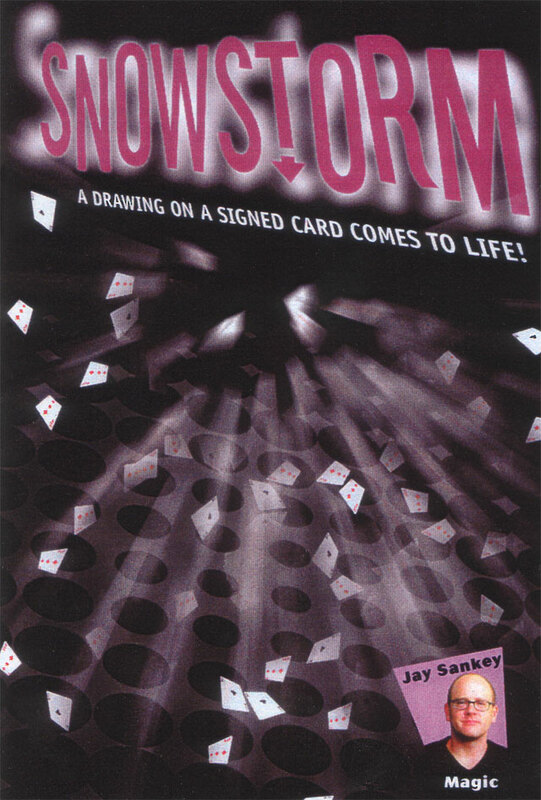 Snowstorm is a trick that was CRAZY when it first came out; people didn't know what to think... This LOOKED like a move that everyone was familiar with to do a change of ONE card into another. Well, Sankey did it, and then with NO adjustment, changed the card a SECOND time. This was a CRAZY thing when it came out. This is the trick only version, totally suitable for performance, and comes with some SUPER high quality gimmicks. Now, these ARE things you can make yourself, but having something to go by is ALWAYS nice. The manuscript details everything nicely, and I enjoyed this thoroughly! Recommended, but I prefer the DVD version. If you would rather have written instructions (or don't have a DVD player) this is a FINE trick to purchase by itself. Jay Sankey has some of the most interesting effects out there and Snowstorm is no exception. He has taken such a basic concept and turned into a stunning routine. Some set up is required before hand but other than that, it is pretty flawless. The reactions that you get from this trick won't be the best reactions you've ever got, but they should still be good nonetheless. From my experience performing this trick, people generally enjoy it. The card revelation will get them more than the changing picture however. If you are looking for something new to try out, pick this up and take a look at some of Sankey's other stuff too. I really mean it, if you like visual magic, it doesnt get any better than this, people can catually see this card change, you learn color changes and sleights, so please trust me, jay sankey is a Genious!!! Buy this now! Mark my word, you will be impressed. I hope this review helps you. I figured out this trick after watching the demo video. The sleights involved are very easy to master, if you know anything about card magic. This is a very visual trick that will amaze anyone. Only downside is that the deck isn't examinable afterward, but with some cleanup that problem can be solved. BUY THIS ONE!!! I have found this effect quite amazing. The instructions are simple. The only thing you need to learn is the twirl change. If you can do it, you will be performing this trick in a matter of minutes. People can't believe thier eyes when they see this one. Plus it's a heck of a lot of fun to perform. This trick is pretty nice, but I always found that the spectators ask to see the rest of the deck and that isn't good because the trick isn't completely examinable. Even then, the trick still impresses people like crazy!! This is so awesome. I've had this gimmcik before, but never thought it was like. By this trick now!!!!! Very easy trick to perform, if you do want an easier backup though, I also suggest you buy a "One way force deck" which is very useful and will help you alot with this trick. Definitely not for the beginner. The instructions are incorrect. Get your card controls down first before attempting this trick.